Come to our store to buy vinyl flooring, and you'll go home with a wonderful flooring option that is beautiful, sturdy, and easy to maintain. Vinyl floors are the most versatile flooring choice available today. Homeowners choose vinyl tile flooring and vinyl sheet flooring because they combine durability and style into an affordable package. This material is also an affordable option, while providing advantages in installation and longevity that make luxury vinyl the cost-effective choice. Exactly the same as luxury vinyl tile or LVT, vinyl tile flooring is one of our most popular floor styles, particularly because of its elegance and timeless look. Vinyl comes in several different formats, including rolls, planks, and tiles. Because of the different options available, this material is appropriate for almost any room in your house, providing fast, convenient results with a lifetime of easy maintenance and style. Another huge advantage of vinyl is its ability to mimic other types of high-end flooring. This is especially apparent with planks and vinyl tile flooring. Because vinyl can be printed in almost any pattern or style, it’s easy to obtain flooring that simulates the look of natural hardwood, ceramic, or porcelain tile. Vinyl sheet flooring is a family-friendly, durable, and scratch-resistant alternative for covering your floor. This option is the key to floors for families with pets and younger children. Typically, sheet vinyl is less expensive than tile or plank vinyl flooring materials. The reason for this cost reduction is the fact that sheet vinyl is easy to mass produce. It is manufactured and distributed on large rolls, which means you do not have to worry about making precise cuts or wasting any excess material. You will work with a vinyl flooring installation specialist to measure the vinyl sheet to match your floor space and cut it down to size. When you work with separate tiles on your floor, they must be arranged so as to build up into a pattern design. Vinyl sheet flooring makes it easy to create a custom pattern because it is already a part of the vinyl sheet. Another wonderful advantage of choosing sheet vinyl is the fact that it is moisture resistant. Because it is usually installed using a single or perhaps two unbroken sections, you do not have to worry about seams running across your floor. The lack of seams means that there is a lack of chinks in the defensive armor of your floor surface. You won't have to worry about water or other liquids flowing through the cracks and seeping below the vinyl. When installing vinyl sheet flooring, it is imperative to make sure that your material is secured properly along the edges, and that any edges are correctly sealed together with adhesive. You can have the natural beauty of wood throughout your home without worrying about high costs or maintenance requirements. Vinyl plank flooring, also known as luxury vinyl tile or LVT, is a very elegant yet quite affordable option for upgrading the floors of your home. One of the key advantages of luxury vinyl plank flooring is the fact that it looks like real wooden planks but is as easy to maintain as traditional premium vinyl flooring is. Plus, it is so simple to install and only requires a utility knife, instead of specialized tools. Although vinyl can be installed at any grade and for any application, our flooring experts especially recommend vinyl plank for high-traffic areas, such as the kitchen or hallways. 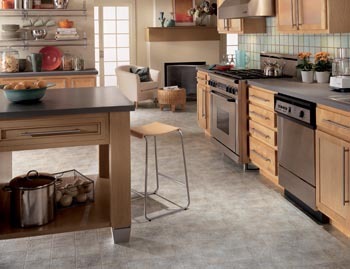 A busy kitchen will greatly benefit from a vinyl plank flooring installation. Vinyl is easy on the feet, while standing up to heavy use. Spills and scratches are no problem for our stain-resistant vinyl floors, and sweeping and mopping on a regular basis will keep your new floor clean and debris-free. Vinyl planks are also waterproof, making them a great choice for installing anywhere where moisture occurs, including kitchens, bathrooms, basements, and laundry rooms. This type of flooring is also exceptionally durable, allowing it to resist wear, scratches, and spills effectively. This also makes cleanup quicker and easier. Just use a vacuum or mop and you will not have to be concerned about staining or warping. Satisfy your decorating plans and your family's lifestyle requirements with attractive and affordable vinyl flooring installation from Porter's Flooring America for any room in your home. Once you’ve chosen your preference in vinyl, our team of installation experts guarantee a proper and efficient installation. The first step to our vinyl floor installation is a free in-home measurement. This service saves you money by enabling you to buy only as much vinyl as you actually need. The properties of vinyl save you money during installation as well. Using the measurement details, vinyl sheet flooring is pre-cut to accommodate AC vents and the shape of the room. This allows it to be easily rolled out and installed without any wasted time. When you work with us, our team completes your vinyl flooring installation quickly. For similar flexibility, vinyl tile and planks can be cut with a common utility knife to allow in-place adjustments to the contours of the room. Call or come in today to find the perfect vinyl flooring for any room in your home. We serve customers throughout Beaumont, Orange, Port Arthur, Nederland, and Port Neches, TX, plus the surrounding areas.